The Herald Sun's campaign against the homeless people of Melbourne has been running for months, ramping up in the last few weeks as authorities have acted to try to move on people sleeping rough in camps outside Flinders Street Station. 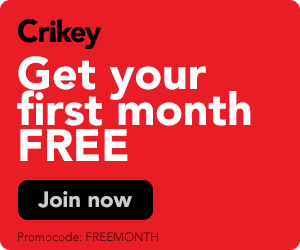 In the space of three days, Lord Mayor Robert Doyle has moved from saying he wouldn't ship out homeless people, to proposing a ban on sleeping rough in the Melbourne CBD. 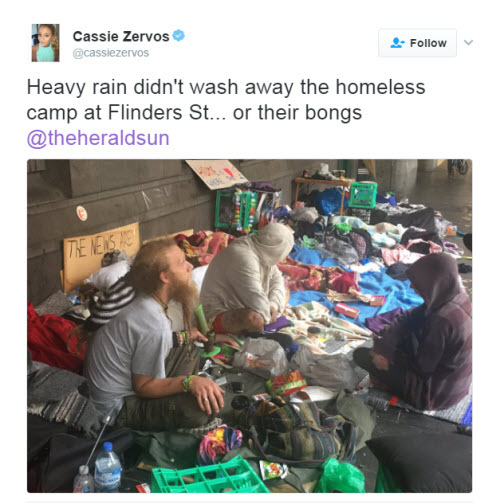 Today, Herald Sun reporter Cassie Zervos tweeted a photo from outside the train station: "Heavy rain didn't wash away the homeless camp at Flinders St ... or their bongs", the "general news reporter" wrote.